I’ve blogged before about the effects of the Part 23 rewrite on the general aviation industry and how technology advances in this industry have increased in the past couple years under the new rules. All of the manufacturers are bringing certified products to the market at a faster pace and aircraft owners have the opportunity to make significant improvements to their aircraft with these new products. The things that we pilots used to sit around and complain about are now finally approved and we have a chance to bring more situational awareness and automation to an aging aircraft with technology similar to that of a modern automobile instead of the technology of a World War II Sherman tank. What has been even more impressive for this industry is the speed at which companies like Garmin have continued to develop the software in their existing products to continually improve them for their existing customers. As a Repair Station and Authorized Garmin Aviation Partner, we constantly get bulletins on the new software being released for existing products and realize the significant improvements to the products that these software updates bring. Let’s face it, avionics equipment is some of the most expensive items in most of these aircraft and who wants to invest $15K - $20K in a navigator or $5K - $6K into a new ADS-B transponder and not get the most out of it? Let me answer that for you….surprisingly, way too many aircraft owners. I can’t come up with a good reason why people come into our shop with an avionics package that was installed 3-5 years ago and has software from the same era. Garmin (as are the other manufacturers) is making significant improvements and enhancements in these software releases so why do people not take advantage of these? Why do aircraft owners not make it standard procedure to get their avionics software updated every year when they go in for their annual inspection? You probably update your personal computer or tablet on a monthly basis, but to allow avionics software in your aircraft to be five years old is a little perplexing. Consider the last year from Garmin as an example. In January Garmin released a free software upgrade (version 6.41) for the GTN 650/750 series navigators which added support for visual approaches which includes advisory vertical and horizontal guidance to most runways. This is a really great feature for VFR pilots who fly to unfamiliar airports and is even more awesome if you have a coupled auto-pilot to fly the visual approach. This past month, Garmin released another significant free software update (version 6.5) for the GTN series which gives you VNAV profiles throughout the enroute and terminal descent phases of flight. 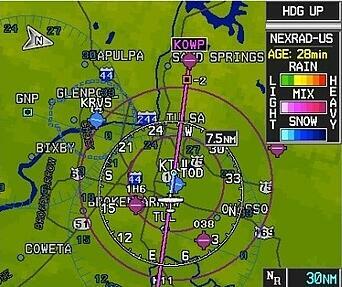 Instead of making calculations in the cockpit, your GTN will calculate and display the Top of Decent (TOD) on the moving map so you know exactly where to start your standard rate decent into the terminal area at your destination airport. It displays your Bottom of Decent (BOD) as well. If you have GTN series navigator interfaced to a GFC 600 or GFC 500 autopilot, you can now select the VNAV button on the mode controller to fly a fully-coupled VNAV profile. Added to that awesome feature upgrade, version 6.5 also added support for terrain alerting including aural and visual alerts and callouts. If you want to get the most out of your GTN series navigator or any of your modern avionics, keep the software up to date. If you want to learn more about these recent software upgrades or about the new products from Garmin, please consider attending our upcoming Garmin Regional Seminar on October 9th at Johnston Regional Airport. Please click here for more details or to RSVP for that event. If you want schedule a software upgrade, reach out to Amanda Rivera by calling her at (919) 912-5798 or emailing amanda@flysparkchasers.com now.